Yesterday I was in Mt. Airy, Maryland for the Mid-Maryland Celtic Festival. I attended two years ago, when it was the Frederick Celtic Festival. Same location — the Mt. Airy Fire Department Fairgrounds — just a slightly more accurate name. Two years ago, a sudden torrential squall developed mid-afternoon, and it was so thoroughly soaking that my sneakers were never wearable again (not even after they dried) and my mobile phone fried. This year, there were rain showers and thunderstorms in the forecast, so I went prepared — I had extra socks in the Beetle, and I had a Ziploc baggie where I could stash the mobile in case of downpours. Though I didn’t buy a ticket for the Mid-Maryland Celtic Festival until last week, this had been on my radar for a while. I skipped Shamrock Fest in March this year, and the Annapolis Irish Festival falls on the same weekend as Shore Leave this year. The Mid-Maryland Celtic Festival is more Scottish-focused than Irish-focused — there are representatives of many of the Scottish clan organizations, there are Scottish games (caber tossing, hammer tossing, sheep tossing), and the opening ceremony features massed pipe and drum bands. The Scottish saltire and the Royal Standard were far more common sights than the Irish tricolor, though it wasn’t absent, and the Welsh dragon and the Manx flag were also seen. I was in Mt. Airy roughly when the gates opened at 9 o’clock. The field was populated with tents for the Clans, and beyond that were tents for the vendors. As they did two years ago, Gordon had a Winnie-the-Pooh plush in a tartan; Milne is a sept family of Clan Gordon. In the activity field below, athletes were already competing in Scottish games. They were throwing hammers this early in the morning. The bar apparatus for the sheep tossing was also set up. Don’t worry, they didn’t use real sheep. They used some stuffed thing that looked vaguely like a sheep. All in all, it looked like it was going to be a lovely day in Mt. Airy. Yes, the Beetle is in that picture. One of the bands performing at the Mid-Maryland Celtic Festival was Barleyjuice. I’ve seen them several times (Shamrock Fest, Annapolis Irish Festival) and they put on an energetic show. After the Barleyjuice set, the festival held the Opening Ceremonies on the athletic field. Various groups were lining up to enter the field of ceremonies. First, the colors were presented. The flags — a 15-star Ft. McHenry flag, the very striking flag of the Scottish American Military Society, and a POW-MIA flag — were paraded onto the field. There was a definite martial aspect to the festival. The flags were followed by the pipe and drum bands. This parade also included Irish, Welsh, and Manx representatives, as well as Clan Woof-Woof, a “clan” of dogs. There were a number of rescue organizations at the Festival, and dogs were a common sight throughout the grounds throughout the day. Each clan, when introduced, would shake their banner and shout out their war cry. It stirred the heart! After the Opening Ceremonies, I had lunch! The Scottish Cottage of Asheville, North Carolina had a food truck at the festival, and I bought their Celtic Combo — Shepherd’s Pie, peat-smoked pulled pork, and haggis. I’d never had haggis before, and I can think of some disgusting ways to describe how it looked, but no one ever told me that it tasted so good! After lunch, I also tried mead! Boudica’s Uprising Honey Grail Sparkling Mead had a booth set up. You bought a wooden tankard (which, despite the stainless steel interior, was more decorative than functional) and, at the beer booth, you received a pour. It was nice. Not really something I would drink regularly. The tankard is now with my Maryland Renaissance Festival tankards. That tankard, by the way, was my only souvenir from the festival. I didn’t see anything that I needed, nor did I see anything that I felt that I wanted. There were kilts and other clothing. There were jewelry and weapon vendors. There were even vendors who had Scottish foodstuffs and Outlander-branded shortbread. (There was a lot of Outlander stuff.) Nothing that I really wanted. Nothing that I couldn’t do without. By 1:30 — just an hour after the opening ceremonies — there was clearly a storm brewing. As the wind picked up, the Clans began tearing down their booths — one handed me a bunch of Walker’s shortbread saying, “Please take it” — and the vendors began to put up their sidebars on their tents. The athletes in the Scottish games tore down the sheep tossing towers and stowed away the cabers. People began to stream out of the gates, and there were traffic jams in the fields where people parked. But the pipe and drum bands soldiered on! The winds were strong and biting, the rain began to fall, and they played on! I, myself, took shelter. I caught the set of Craggy Island, named after the location in Father Ted. Rain fell, sometimes heavy, and Mt. Airy saw truly Scottish weather. About 3:45 the rains stopped, and the storm clouds blew through, with clear sky emerging in the west. 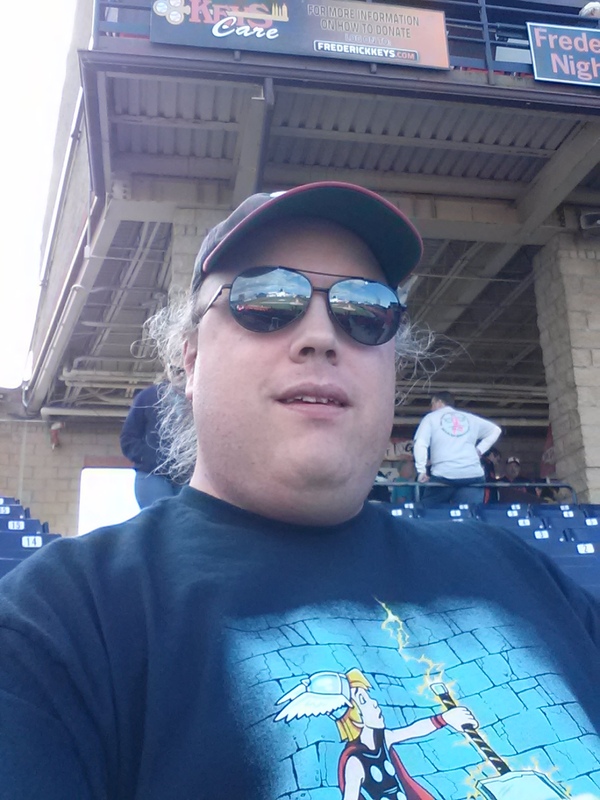 This was a good thing, as I had other plans for the day — since I was going to be in the Frederick area, I’d decided to take in a Frederick Keys baseball game. The Keys, the High-A affiliate of the Baltimore Orioles, were playing the Myrtle Beach Pelicans, the High-A affiliate of the Chicago Cubs. Baby Cubs and Baby Orioles! So, after seeing some of Barleyjuice’s second set, I left the Mid-Maryland Celtic Festival and drove over to Frederick. I’ve driven past Harry Grove Stadium many times on I-70, so it was interesting to see it up close. I know some people, both personally and at a distance, who rave about Harry Grove Stadium. The seating bowl is certainly nice. The Great Wall of Advertising is not. I like baseball stadiums with character, that acknowledge and embrace the world beyond the stadium and the outfield wall. I didn’t find a lot of character to Harry Grove. The concourse is cramped and far too small. The outfield wall lacks dimensional quirks and closes off the game from the world beyond. If it were up to me — and, thankfully, for all concerned, it’s not, I’d take down the top row of advertising. The Keys produced a very nice program booklet. (I especially liked the smell of the paper and ink. Working in publishing, that’s almost the first thing I notice.) The copyediting on the booklet left something to be desired, but all in all, it was an attractive package. As we neared the 6 o’clock game time, interesting and fast-moving cloud formations approached from the west. Nonetheless, it was certainly shaping up to be a lovely evening for baseball. Ten minutes before the game, we had the ceremonial first pitches, including a former Washington football player. Then, at 6 o’clock, when the game was scheduled to start, they rolled out the tarp. Those fast-moving clouds had turned dark and stormy. We entered an hour-long rain delay. The tarp was taken up and, at 7 o’clock, Rashad Crawford stepped into the batter’s box for the Pelicans. Light rain began to fall during the first inning. Ironically, no rain fell during the hour-long rain delay. Frederick’s starter — whose name I do not have, as the rosters in the program book are out of date — went three innings. I have no idea why he only went three innings, as he wasn’t pitching a bad game. Max Schuh came on in the fourth. He gave up a lead-off single, but then got two fly outs and a ground out. In was in the fifth inning that everything went to hell for Schuh. It was a comedy of errors. Single. Single. A bunt single that loaded the bases with no outs. Single. (Run scored.) Another bunt single. (Run scored.) A broken bat single into center. (Two runs scored.) A pop fly into center… that the center fielder dropped! (Scored an error, bases loaded.) A double off the center field wall. (Two runs scored.) Then, a 6-3 groundout (the first out of the inning!) that Myrtle Beach’s manager tried to argue should have been a foul off of his foot. The tenth batter of the inning — Walk, loading the bases again. Schuh’s night was done. Ten batters faced. One out. Six runs allowed, four earned runs allowed. Ivan Hernandez came on in relief. Quick three-pitch strikeout, for the second out of the inning. Then he gives up a two-run double into the right field corner, followed by a walk. Ian Happ, the fourteenth batter of the inning, with runners on first, hits a ground ball to second, and the runner from first was forced out. This inning was interminable. By now it was nine o’clock, the wind was whipping up, and the temperatures were plunging. People had been leaving since the second inning, like the family in the row in front of me. I’d seen enough of this garbage game — there’s no other term for it, the Keys played a garbage game — so I also gathered up my things and left. I’ve stayed through some terrible baseball games in my life, I’ve stayed through some baseball games played in unspeakable weather, but there was no upside to staying for this game. Among those things? A twenty-five dollar gift certificate to Buffalo Wild Wings’ Frederick location and a bottle of BWW-branded barbeque sauce. Before the game, circa 5:30, on the video board they announced “Tweet Your Seat” — take a selfie and tweet it at the Keys’ Twitter account with your seat location. I did, out of an “Oh, why not?” impulse, and, in the third inning, some Keys staffers came to me with a dopey crown I had to wear and a bag of stuff. I’ve never been to a Buffalo Wild Wings, so I guess that sometime I’m passing through Frederick I’ll have to stop and use my gift certificate. All in all, Saturday was a lovely outing.